I could eat fish daily. And I do, and then I would get sick of it. Thats why I have a big bag of tilapia in my freezer just hanging out. My recent inspiration part Paleo, part LCHF (low carb high fat), or any version of those has kicked me into gear. This past week I have been experimenting and I have never felt better. Some times though I need a small cheat. But there's one thing I enjoy is a little research. 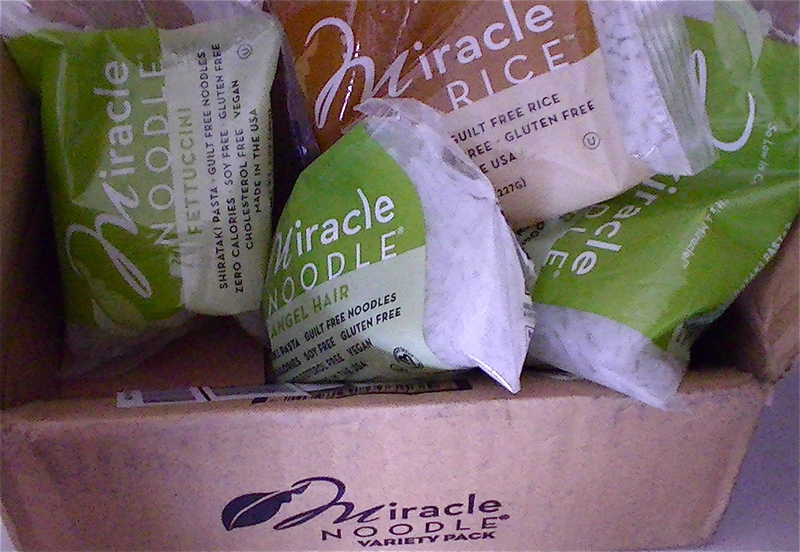 I came across Miracle Noodle. I have been aware of this product, and have seen a little chatter in forums. Can it be carb free, calorie free? How can a gelatinous noodle be tasty? Well I am on my third bag. I can say I am beyond happy. happy, happy! It's all about the recipe my friends. I needed to trick my mouth that I was having some sort of carb. I have been very satisfied lately, but I wanted to make an exceptional meal for myself to test my new LCHF muscle. What I have learned and is very much stressed in any of these lifestyles is: no calorie counting, and healthy fats, and protein in every meal. 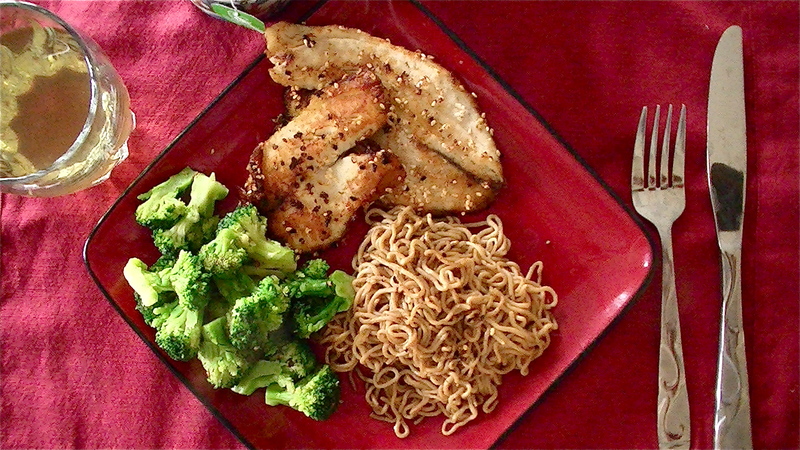 This tilapia dish is my attempt at an Asian inspired dish. 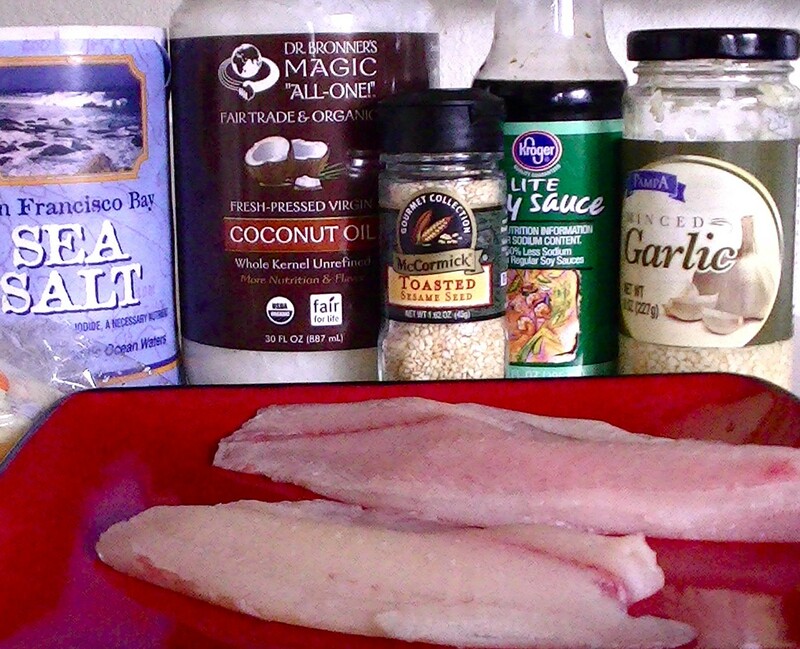 My favorite thing about this fish is how it cooks up in the coconut oil. The crispy texture around the edges, and the way it melts in my mouth was just beyond words. Paired with the Miracle Noodle I was left satisfied, not bloated. 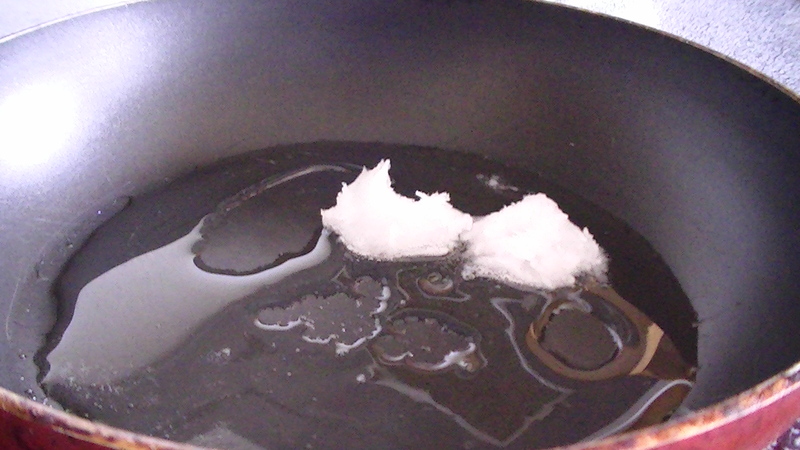 Melt your coconut oil, remember unrefined, virgin is always best. 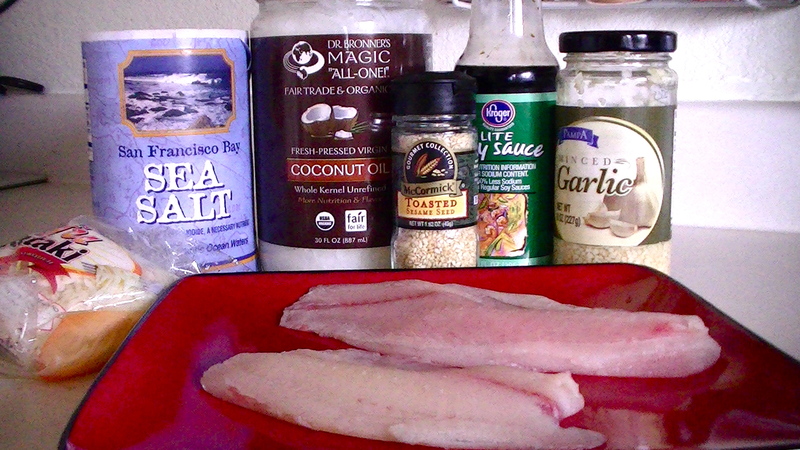 I used a healthy tablespoon for my two filets. 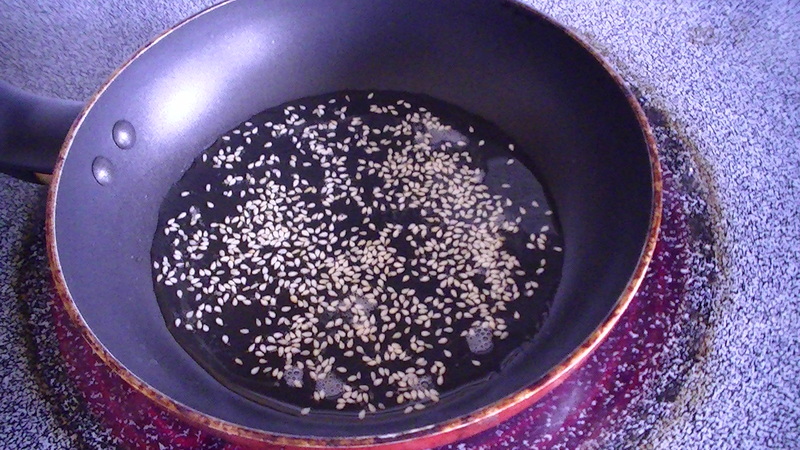 Sprinkle a layer of toasted sesame seeds evenly over your melted oil. Place your filets in gently. Cook over medium heat. You want to do the majority of the cooking on one side on medium heat. Not too high, the pan will spit at you! Make sure you have enough oil that it bubbles all around the edges. This will make that amazing crispy texture. While they are cooking add your chopped garlic. Spread your garlic around. 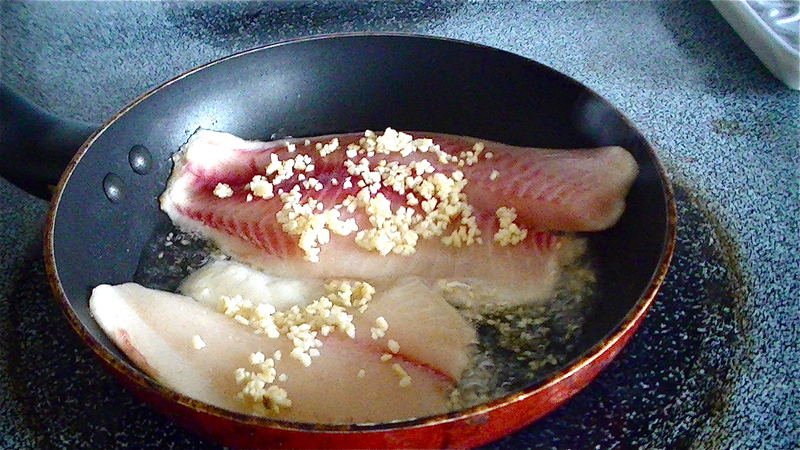 Again leave your fish on one side for about 8 minutes or you see the light brown crispiness forming on the uncooked side around the edge. You want it cooked most of the way through. Because when you flip to do the final side you do not want to burn the garlic. While all this is going on cook your broccoli, you will be tossing it in when it done. Now flip! 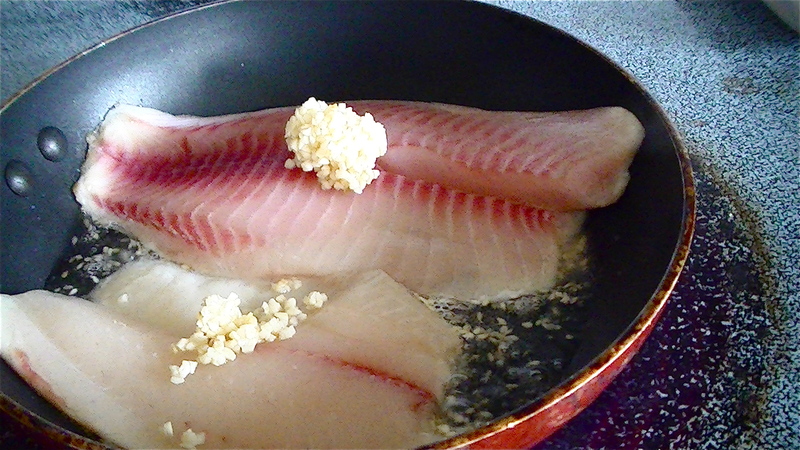 Your filets should be beautifully browned, and nice and crispy around the edges. You only need a few minutes to finish of the other side. Keep an eye on it. Burned garlic isn't to pleasurable. 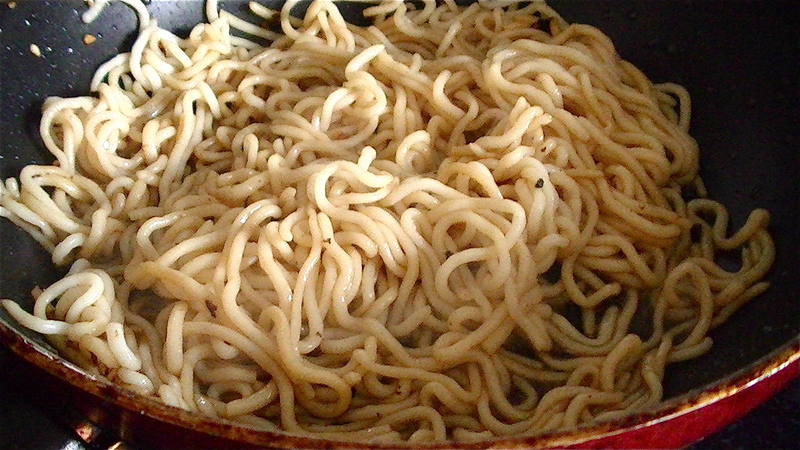 In the few minutes you have get your Miracle Noodle ready. Rise, drain , pat dry. Really shake them out, make sure there is no stuck together clumps. I know it looks like jelly fish tentacles. But they cook up amazing! 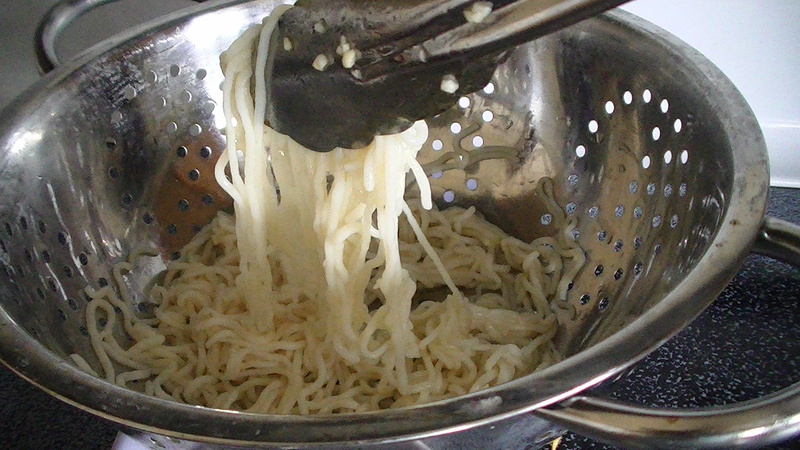 Remove your fish and set aside, now toss noodles into the same pan. Add your soy sauce. For this portion I stuck with the serving size from the bottle which was a table spoon. It was perfect. 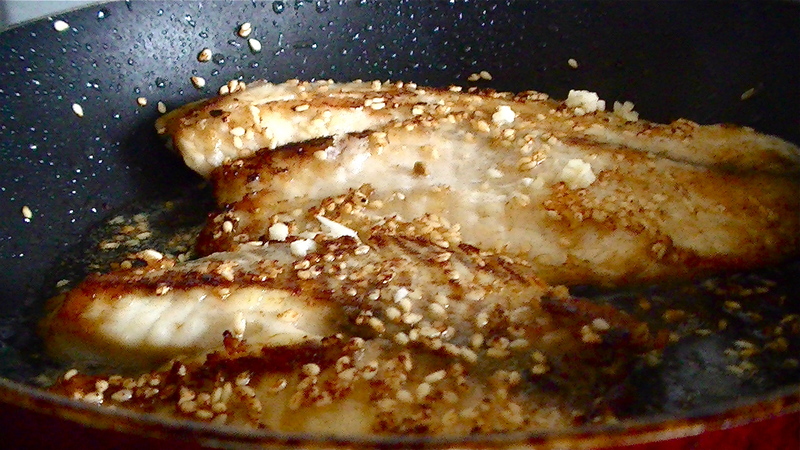 Really stir it around, make sure you absorb as much of the oils, and sesame seeds. 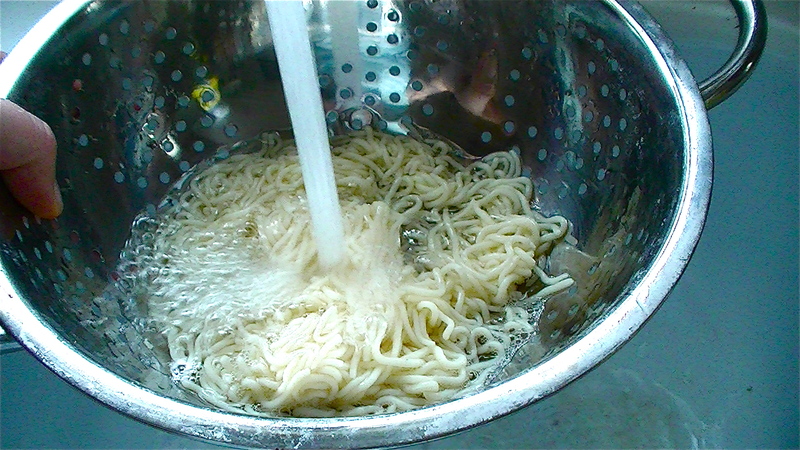 These noodles cook in minutes. They will become more solid; not just a limp wet noodle any more! Remove and set aside. 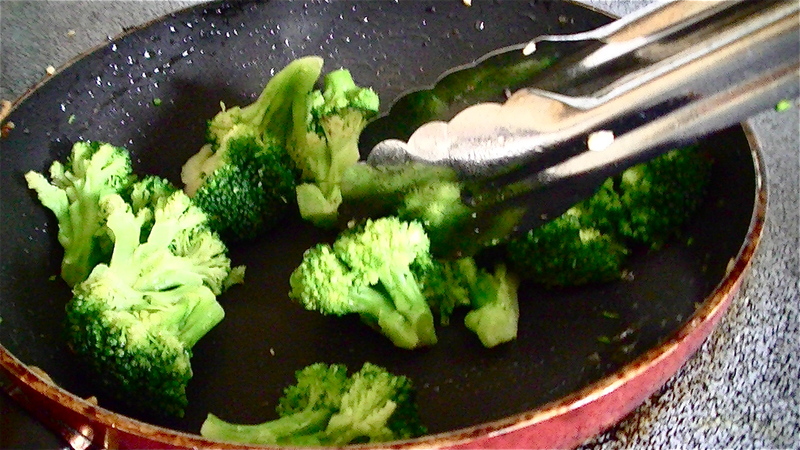 Add your cooked broccoli. Again you are stirring them around to pick up oils, and sesame seeds. This was probably the most satisfying lunch! It will make an appearance for dinner for sure.